Huzoor (May Allah be his helper) said Alhamdulilah, All praises be to Allah that Jama’at Ahmadiyya Regina has also been enabled by Allah Almighty to build a mosque. MashaaAllah it is a very beautiful mosque. At this time the number of Jama’at members here and in the surrounding areas is 160. And the capacity in the mosque which I have been told in all halls of the mosque is of 400. An additional space of 100 people is there in the common area. If needed, more capacity can be created in the neighboring area. At present, considering the number of the people, the mosque is 3 times larger than the current need. I have been told that all the expenses have been borne by the local Jama’at or they have promised to pay for the expenses. One third of the expenses have been promised to be given by 2 people. One of them is the widow of Dr. Shams-ul-Haq Shaheed. At the time of construction of mosque the constructor gave the lowest tender of 2.8 million dollars and it became 3.5 million dollars after including other expenses. But all the expenses which were incurred in its completion were 1.6 million dollars. A worldly person listening to this will be very much surprised as to how is it possible that the total expense has been less than the minimum tender given by the constructor. This is because he does not know that what has been sacrificed. He does not know about the high standards of sacrifice that have been set up by the Jama’at of Promised Messiah (a.s.). The examples of sacrifices of life, wealth and time are merely found in the Jama’at of Promised Messiah (a.s.). This temperament of the Jama’at members is found everywhere. Be it Pakistan where there are Ahmadis who are ready to sacrifice their lives and wealth, be it Africa where people might not have wealth but they sacrifice their time and give whatever little they have is offered for the construction of mosques or to the Jama’at. Whether it be Indonesian Ahmadis or of Europe or of Canada or be them belonging to any part of the world, Allah gives them the opportunities to sacrifice because they have preferred Allah’s happiness and pleasure as their goal of life. In the construction of this mosque, the half amount of money that has been saved is due to the efforts of three brothers who are involved in construction business and currently residing in Saskatoon. Likewise, other members also put in their share of work. These brothers were also helped by another contractor who came from Toronto after finishing his work and who was sent by Allah. However, they all worked as a team with members from Saskatoon, Edmonton, and Toronto. These teams included Khuddam and Ansars. Except for the little expertise that the Jama’at members there did not have all work has been done by the Jama’at members themselves. A worldly contractor will not think that way. But these people have not worried about their wealth and time. Likewise, the Lajna apart from financial sacrifices have participated in the work by cooking food for these teams. I have been told that approximately 41.5 thousand hours have been invested in the construction of this mosque. Some have spent many hours irrespective of the time of the day or the day of the week. They must have worked constantly. 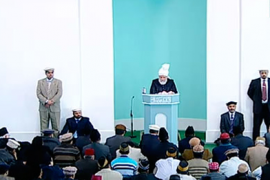 This enthusiasm is evident in Ahmadis throughout the world. On the one hand some Muslims in the world are busy in spreading chaos while on the other hand Ahmadi Muslims are busy in sacrificing their time and wealth in order to build mosques in such developed countries. This is because Holy Prophet (Peace be Upon Him) said that whoever builds Allah’s house is actually constructing his/her house in Jannah. This is because the Promised Messiah, the obedient servant of the Holy Prophet (Peace be Upon Him) taught his followers to build mosques in order to spread the peaceful message and beautiful teachings of Islam to the world. Therefore, the sacrifices are put into the construction of mosques firstly, to gain Allah’s pleasure and secondly to eradicate the wrong impression of Islamic teachings from people’s minds. And to tell the world that Muslim’s mosques and the teachings of Islam does not demonstrate hatred, chaos or turmoil but instead they are a source of benevolence for this life and hereafter. Also it is a source to create the love of Allah and His creation in people’s hearts. By the construction of this mosque, the Canadian Jama’at got the honor that Ahmadi members saved money by participating in the work themselves. This has happened here for the first time. May Allah give reward to the people who have sacrificed their wealth, time, whether it is men or women who have given or promised large amounts of money. May Allah accept their sacrifices and bless them even more. Therefore we should work hard to fulfill the wish of Promised Messiah (a.s.) and also give importance to the condition that has been stated by him. There should be fidelity and sincerity rather than temporary enthusiasm and emotions. That the only motive is to build a beautiful mosque, rather it is essential to fulfill the actual purpose. Mosques shall not be built to merely showoff the building or architecture or to show the financial or time sacrifices. It should be merely for the sake of Allah. As I have mentioned that the fourth contractor was also involved who met me yesterday and was happy that Allah blessed him with this opportunity. Likewise he has been given more contracts. Allah always rewards you for the good one has done. Be it at the same moment of time or later but Allah does return it. One of the brothers, Mansoor Sahib wrote to me that a boy who had got admission into a university and thus left the work. He then had a dream that the contractors need him for the work. Therefore, he contacted and started work. Their financial condition was not good and the wife said that there is no money left to run the home. Allah blessed and on that day or the next day Balmain Tax Credit returned money that he had paid in extra. Later they got money from child benefit department and thus they received about 13000 or 14000 dollars. All that is required is pure and honest intentions and Allah blesses in return. In Africa, there are many people who by the grace of Allah contribute for the construction of mosques. I remember that when I was in Ghana, in the city of Tamale, there was a small mosque that was built of blocks and it was cemented in order to make it stronger. After Khilafat when I, for the first time went to Ghana and visited Tamale, I witnessed that there is a very big 2 storey mosque built there. It would be approximately three times the size of this mosque. It also has other offices with it. It was told to me that an Ahmadi member paid for all of its expense. I also know that it was not easy for that member. He paid it over a time period of 3 to 4 years but still he said that he will undertake this task. Thus, this attitude of Ahmadis is found everywhere. People might think that due to the adverse economic condition people in Africa may be greedy but whenever they have money, they set up such high standards of sacrifice that they are very rare. Everywhere this attitude of building mosques and making sacrifices for it is found. In Pakistan, we cannot build mosques. People write to me with immense agony that please pray that we be allowed to make mosques. We cannot build mosques due to the law there so at least be allowed to make halls where we can pray in congregation. It is impossible to even think of constructing minarets and dome, however cannot even make a simple Mihrab (a niche marking the direction of prayer). But at some places there is so much strictness that at some places we cannot even make a building facing the direction of Qibla. But Allah is blessing us abundantly outside Pakistan in a way that is not even imaginable. These are the blessings of Allah. Thus we are full of thankful emotions towards our Lord. Thus the belief in Allah and in the Day of Judgment is an essential requirement to be a Muslim and a ‘Momin’. Then Allah says that it is important to pray Salat. Thus what is it? It is praying Salat in congregation 5 times a day. Then it is to give Zakat. What is Zakat? It is to sacrifice your wealth in the way of Allah and to purify it like this. By the grace of Allah Ahmadis are devoted towards this teaching. But many lack in praying Salat and specially praying in congregation. Thus it is the main essential requirement that must be fulfilled. About Zakat I want to tell that there is Zakat that is compulsory on every wealthy person who has money in banks or with themselves, who has gold or silver. Then people who own dairy farms are required to pay Zakat. It includes all men and women. And it has a calculated amount that Holy Prophet (Peace be Upon Him) has designated since his time. Likewise, I want to say that women should particularly consider paying zakat. Coming to these countries makes them financially well off and they own a lot of gold. It includes old women and young women too who wear gold bangles and they may wear it because Allah has declared it to be an embellishment but it is essential to pay zakat over it too. Then it also includes all the financial sacrifices that are done for spreading the word of Islam and its related works such as fulfilling the rights of people. By the grace of Allah it is only Jama’at e Ahmadiyya that spends in the way of Allah to spread the word of Islam. This includes spending on construction of mosques and mission houses, the institution of scholars, construction of schools and hospitals. Then Allah says that you should not fear anyone except Allah. If a person is fearful of Allah, only then he/she is saved from a number of sins. They can be saved from a number of ill acts that are prevalent in these countries in the name of independence. Always remember that Allah’s fear is very essential and it is indeed ‘Taqwa’ which is mentioned many a times in the Holy Quran. Thus if one follows all these commands then consider yourself to be included amongst the righteous. It is these acts and it is indeed this steadfastness in faith that fulfills the purpose of construction of mosques. It is this that makes one thankful to Allah. Merely being happy over the fact that we have constructed a mosque and then showing up very rarely for Salat, and embedding more fear of people than Allah’s fear, greediness for the worldly pleasures and giving importance to worldly matters and forgetting the true essence of the purpose of mosque, might help us earn a temporary good but will not be successful in earning Allah’s continuous blessings. Therefore Allah says that the true population of mosques is from people who grow through their faith and good acts. Firstly it is the duty of the office bearers of the Jama’at that they keep the mosques populated by their presence. In order to get the continuous blessing from the sacrifice of wealth and time that has been done by the Jama’at, the office bearers and every member should try to make this mosque (that is currently three times larger than the Jama’at here) smaller for their needs. The mosques grow smaller of needs when the number of worshippers in it increase and when the number of Jama’at members increase. In order to increase the number of Jama’at members it is very essential to undertake preaching (Tabligh) of Ahmadiyyat. In order to thank Allah for the blessing of the mosque you shall undertake preaching and should be spreading the word of Ahmadiyyat to every person living here. Along with thanking Allah, it is indeed fulfillment of the rights of these people. It is the right of these people that we spread the word of Islam to them. And to help them come out of all the ill acts. It is our duty to tell the people about their Creator. At this time, majority of the people are inclined towards and lost in the worldly matters and development but they do not know that there lies a dark ending to all these worldly glitters and sparkles. At this time, it is the responsibility of the members of Jama’at to show them the path that will lead to their bright endings. Tell them that the worldly sparkles are just for a limited time, but the lights of a good hereafter will shine forever. This is attained by worshipping Allah. This will be attained when we will be more worried about our hereafter than our worldly matters. We won’t be just enchanting slogans of love and peace but will be in fact fulfilling each other’s rights and will be raising the standards of our worship and will be trying to gain Allah’s love. Our every say and act will not only have love for Allah but even for His creation. The people who come close to us by hearing our slogans and who get impressed by the Islamic teachings we preach, should never be disappointed by us. They should never be given a chance to proclaim that we are not as we seemed to be. We should try to make this world a place of heaven through our worship and acts. Holy Prophet (Peace be Upon Him) said that also eat and drink while you pass by the gardens of Jannah. Hazrat Abu Hurairah (Allah is pleased with him) says that I asked Holy Prophet (Peace be Upon Him) that O Prophet of Allah what are the gardens of Jannah? Holy Prophet (Peace be Upon Him) replied that mosques are the gardens of Jannah. Then asked O Prophet (Peace be Upon Him) what is meant from eating and drinking from the gardens of Jannah? Holy Prophet (Peace be Upon Him) said it is the remembrance of Allah, ‘Tasbih’; repetitive utterances of short sentences in the praise and glorification of Allah and poem of Allah, to say SubhaanAllah, Alhamdulilah, La illaha illal Allah, Allah o Akbar. Saying all this is like eating and drinking from Jannah. Thus along with praying Salat at the mosque, reciting these verses is equivalent of eating the fruit of Jannah in this world. And the person who recites these verses and proclaims the greatest of Allah and remembers Allah through these verses will not even attain Jannah but in reality by following the commands of Allah also tries to fulfill the rights of people. Try’s to adopt his acts according to the teachings of Allah. Thus how blessed are the people who eat the fruits of Jannah in this world and will be attaining Allah’s pleasure in hereafter too. They are included in the group of people who for the pleasure of Allah live in accordance to Taqwa. Promised Messiah (a.s.) says that in the Holy Quran in comparison to all the commandments, immense importance has been given to Taqwa; God consciousness and God fearing piety and virtue. It is because Taqwa gives the strength to refrain from committing sins and compels to drive towards doing good deeds. It is indeed an amulet of safety and a remedy to be protected from every trial. It is a very strong castle which protects a person from evil. A person who follows the path of Taqwa (God fearing piety) can be protected from many ill doings which other people undertake and which leads them to their destructive end. Everyone should remember that the examples of sacrifice that are shown, they shall be linked to Taqwa or else they will be of temporarily good. As I said that thankfulness is a way to fulfill the right of preaching. But after the construction of the mosque there will be many people who will be attracted towards it and eventually be interested in you and in the Jama’at. At that time every Ahmadis actions and God fearing piety will provide guidance to these people. Thus this mosque is putting a responsibility on every Ahmadi living here and every Ahmadi needs to be a role model in order to fulfill these responsibilities. Promised Messiah (a.s.) says that the people of our Jama’at should be role models for others. Any person who belongs to our Jama’at and demonstrates a depraved model and shows weakness in good actions is indeed a cruel person because he portrays a bad image of the Jama’at and of us. Bad morals inculcate hatred while virtuous characters and acts result in propensity toward good. Promised Messiah (a.s.) says that we receive many letters which say that although we are not part of this Jama’at but by observing a few members of the Jama’at we develop an idea that the teachings of this Jama’at is based on piety. Even today many people write to me and even during meeting me they proclaim that meeting the members of Jama’at reflect that your teachings are based on peace, love and care. Thus in order to adhere to such characters and follow such teachings and to inculcate such goods into one self is essential for every Ahmadi. Promised Messiah (a.s.) says that Allah also composes a dairy of person’s every day’s doings and acts. Thus every person shall also do it personally in order to analyze daily good and bad deeds. It should be analyzed whether one grew in good deeds or not. He said that a person’s yesterday and today shall not be the same. The person who’s yesterday and today is at the same level while analyzing the good deeds done then that person is not profited. You should not be happy that the good deeds are at the same level but indeed you should increase your goodness level every day. If a person who truly believes in Allah is never wasted. Instead many lives are saved in return to that one person’s belief. Therefore, it is Ahmadis duty and responsibility to save the world from calamity and destruction. But for this the condition is that we should elevate our level of goodness every day. This world who is forgetting the existence of God, we should help save them. Although there are some people who possess good morals but there are others who have lost their morals on the basis of independence. The world has completely forgotten Allah. In such a situation, if the followers of the Promised Messiah (a.s.) also tend to forget their values, Allah and the teachings of Islam and go astray then who will correct the world? Thus it is the responsibility of every Ahmadi that according to the saying of the Promised Messiah (a.s.) we should undertake our daily analysis so that we fulfill our responsibilities to the best of our abilities. Should not be merely happy by constructing a mosque but our target should be to increase the number of people who believe in Allah and our beloved Holy Prophet (Peace be Upon Him). This cannot be accomplished until we tend to move forward in doing good deeds every day, until each one of us is a role model for ourselves and for others, until there is no one who gives agony to others instead who fulfills the rights of others. Promised Messiah (a.s.) says that it is required that for one self, and for your children and wife, relatives and for us be a source of blessing. Never shall we give any chance of criticism to our opponents. Thus every one of us should feel this pain of the Promised Messiah (a.s.) and we should be the models that are source of good words for the Jama’at and for the Promised Messiah (a.s.). May Allah help us achieve this. May our tomorrow be better than our today. May our children and our generations be understanding that the sacrifices made by their parents, the mosques constructed by them and the preaching work done by them, the inspiration that they provided to their kids to always prefer religion over worldly matters is indeed the actual wealth that they have left for them. May the generations be able to embed these values and thinking in their upcoming generations. And may this series be always continued by the will of Allah. May our upcoming generations be receiving the blessings of Allah. May this happen by the will and wish of Allah. Ameen.